A quick, convenient and modular carryall sized for two AR magazines, the 2-Banger from 5.11 Tactical keeps you locked and loaded in any situation. Ideally suited for quick-prep or urgent operations, the 2-Banger can replace a full mission pack or active shooter bag to minimize response times without sacrificing performance or tactical capability. The central compartment houses two fully loaded 5.56 magazines with your choice of either a traditional flap or bungee cord cover, while elastic bands and compression straps provide stable and secure retention. 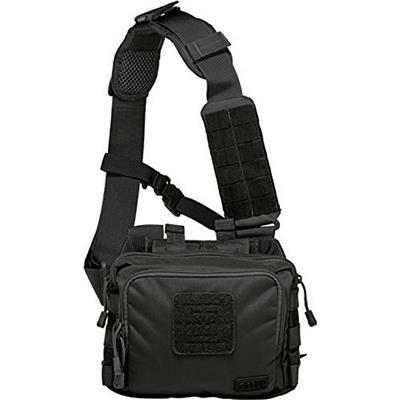 A secondary forward-facing dual-zip pocket provides plenty of space for documents, maps, or optics, a concealed pistol compartment at the rear stores a back-up sidearm and a 3x3 loop patch at the front supports a flag or ID attachment.